Sand and sediment interceptors are made to separate and capture sand, gravel and other debris, as well as any oil, grease, gas or diesel fuel-laden waste. Gravity and flotation separation are used together to accomplish this. The separator has chambers that vary in elevation, trapping nearly all solid materials which will separate from water due to gravity. Each compartment traps material of different size and weight. Heavier and larger particles will be trapped in the first compartment while each subsequent compartment will trap smaller and smaller particles until virtually all solid material has been removed. Gas, fuel, and oils become trapped at the surface of the compartments. 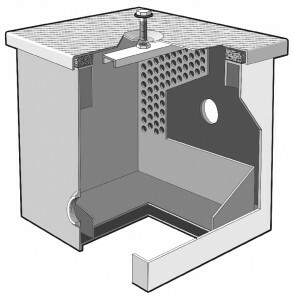 Gaseous fumes collect above the water and below the cover and are vented through vent connections.